Unlike most of the e-cigarettes I’ve reviewed so far, the Talon Tank System from Revolver E-Cigs doesn’t have that analog look. It’s considerably longer, bulkier and a bit trickier to use, but this model definitely has its advantages. The Talon is just a branded version of the popular eGo T vaporizer, the kind you can find at most e-cig suppliers, under various names and set-ups. 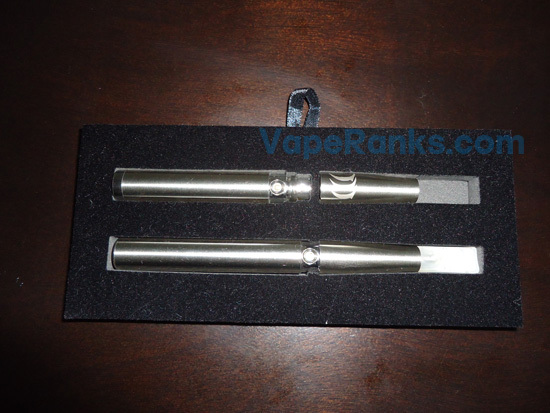 Revolver’s package, for example, features two batteries, a standard 650 mAh and a heavy-duty 1000 mAh, and low-resistance tank atomizers that improve vapor production. 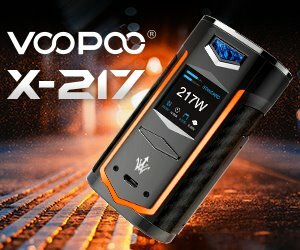 While it’s not the ideal electronic cigarette for beginner vapers, it’s definitely worth a look if you’ve been wanting to take your vaping experience to the next level. Most e-cig companies offer a variety of starter kits, from budget packages to expensive feature-packed deals, but Revolver only offers one variant for the Talon Tank System. It comes in a black rectangular magnet-top cardboard box and features the red talon logo. Inside, you’ll find two manual batteries (650 mAh and 1000 mAh) both with a standard 510 connection, 2 metallic tank atomizers (a.k.a. tankomizers), 5 blank plastic cartridges, a USB charger, a wall adapter, a USB cable, a carrying pouch, a 5 ml bottle of e-liquid and 2 cartridge covers. It’s a pretty complete package for this kind of model e-cigarette, so two thumbs up for Revolver in this department. Although presentation only goes so far, I was pleasantly surprised by the metallic finish of the batteries and tankomizers, and appreciated the little things like the Revolver and Talon logos etched on the components. It might not affect the performance of the e-cigarette, but these seemingly unimportant details say a lot about the company. The clicky buttons of the batteries seemed pretty sturdy and ready to take some heavy punishment and the overall build quality of the units left me pretty impressed. Although the packaging wasn’t nearly as nice as that of the Green Smoke, for Example, it’s what’s inside that counts in the end, and I was very pleased with the contents of the Revolver Talon starter kit. Analog-like e-cigarettes have their advantages: they draw less attention, are easier to carry around and, most importantly, their look and feel make ex-smokers more comfortable, easing their transition from tobacco cigs. That said, all mini-style electronic cigarettes are plagued by the same big issue – low battery life. While some batteries are better than others, you can only store so much power in such a small container. If you’re fed-up with having to recharge your e-cig batteries several times a day, the Revolver Talon might be the perfect solution to your problem. It comes with two large batteries that are guaranteed to get you through the day. For me, the smaller 650 mAh was more than enough for a day of heavy vaping, while the 1000 mAh unit only needed recharging once every two days, sometimes even three. Considering, most vapers can consider themselves lucky if they get through a whole day with two fully-charged mini e-cigarettes, the Talon is a very big improvement. There’s really no point in arguing the quality and performance of eGo batteries, they’ve been around for a long time, they’ve proven their worth throughout the years, and Revolver’s units are no exception. Apart from the excellent battery life, these batteries also feature useful features like the on/off mechanism activated by pressing the activation button five times within two seconds, which helps avoid the unit accidentally firing off in your pocket, thus conserving power and avoiding battery damage. Another feature worth mentioning is the possibility to turn the 650 mAh battery into a USB passthrough by unscrewing the end cap, and connecting it to a USB port via the included USB cable. I’ve personally found the Talon Tank System pretty easy to assemble and operate, but then again, I’m a big fan of manual batteries and have some experience with tank vaporizers. Basically, all you have to do is remove the plastic cap of the cartridge, fill it with juice, put the cap back on and stick the cartridge inside the atomizer. Don’t be afraid to put some muscle into it, you have to make sure the short metal spike inside the tank atomizer pierces through the little cartridge hole so it can wick the e-liquid. Then screw the tankomizer on to the battery and you’re good to go. It’s not as easy as unwrapping a cartomizer, and it can be a little messy if you’re not careful, but as I said, this particular model does have its advantages. If there’s one thing you don’t have to worry about when using the Revolver Talon, it’s vapor. If you’ve ever used an eGo,you know what I’m talking about, but the tank system is even better. This thing produces even more “smoke” than a regular cigarette, let alone smaller e-cigs, so if vapor production is an important factor, you can’t go wrong with the Talon. I used only 100% propylene glycol e-liquid, known to produce less vapor than vegetable glycerin, and I still got satisfying mouthfuls of goodness with each drag. All you have to remember is the tankomizer has to be broken in before you can really enjoy the Talon. So don’t be discouraged if the first few puffs aren’t as impressive as you has expected, this thing will not let you down. 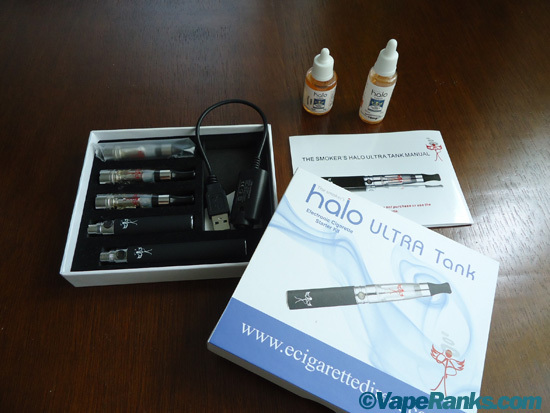 The original eGo tank system is pretty controversial within the vaping community, and for good reason. In the beginning, it came with standard resistance atomizers that had people labeling its vapor production as average. Luckily, Revolver fixed this issues by using low resistance attys which make all the difference in the world. Although, I’m more than please with the kind of vapor I get from using smaller e-cigs like the Bloog MaxxFusion or Green Smoke, the Revolver Talon is on a different level. I can even say it’s vapor production is on par with that of advanced mods or dripping directly on the atomizer. You’ll probably get to try those at one point, but for the average vaper looking for outstanding performance at an average price and without major hassles, the Talon Tank System is perfect. One thing I noticed about the Talon, is that despite the incredible vapor production, the throat hit wasn’t as strong as I would have liked, not even when using 24 mg nicotine e-liquid. I don’t know if it’s the polyfill, but the same juice has a lot more punch when used with a cartomizer. The difference isn’t that big, but it’s noticeable to a seasoned vaper. You’ll have a tough time finding an electronic cigarette company that can compete with Revolver in the flavors department. 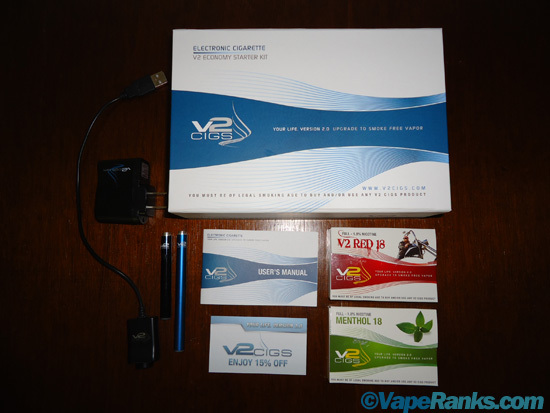 They have over 100 available flavors, including 21 tobacco varieties, as well as menthols, fruity and sweet tastes. There’s something in their lineup for everybody, and even though I’ve only had the pleasure of trying their red tobacco and the menthol, those two were pretty delicious. The rugged tobacco is very strong, but it also has a nutty undertone that makes vaping it very pleasurable, while the throat-freezing menthol was as refreshing as I’d hoped. They make both PG and VG based juices and the best part is they’re made in the USA. I enjoyed the e-liquids the guys at Revolver sent me with the Talon starter kit, but you should know the tank system is notorious for muting flavors. No, it doesn’t make it tastless, but compared to vaping it from a cartomizer, the tanks made it slightly less flavorful. This isn’t a deal breaker, at least not for me, because just like with the throat hit, the difference isn’t that great, but I though I’d let you guys know about it. Another thing you should be aware of is this thing eats up a lot of e-liquid, fast. It produces clouds of vapor, but it apparently needs a lot of juice to do that, so make sure you stock up on your favorite stuff. After a few drags you’ll notice the level of e-liquid in the cartridge going down, but I personally didn’t mind one bit. I’d much rather have a satisfying vaping experience and pay the price in juice. The Revolver Talon Tank System costs $74.99, and is worth every penny, as far as I’m concerned. 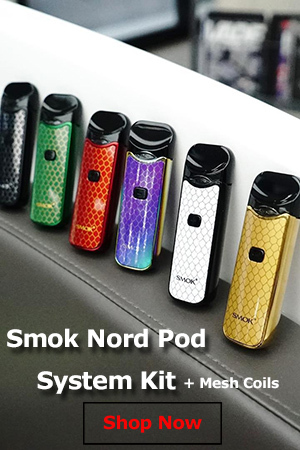 You’ll find many inferior electronic cigarette kits for double that, so if you’re looking for an upgrade to your mini e-cig, or if you’re an ex-smoker who’s not afraid to get his hands dirty for a pleasurable vape, I say go for it. Works very well but unable to get an adaptor for the larger tank due to demand. It has been one month & I am smoke free but need that adaptor which is not in stock. Who makes it? What is the hold up in production? I love my Revolver Talon but find that they carry a very low stock. I am trying to find an online store that carries compatible cartridges and e-juice tips that are compatible for filling. Any suggestions? Love the Talon it has long battery life. Benny all the tools are compstiable. I really like it but I have found 1 problem. The atomizer is only lasting about 3 weeks, I was told when I bought it that they should last 3 months, there is no way they will last that long. With that said at $11 for a new one I guess I can live with that. I love my Talen, been using them for 2 years…For 3 weeks now they have been out of the atomizers and I am getting really discussed.The company is going to force me to go to another e-cirg. I hate to but if they don’t carry anything in stock, what is a person to do? I’m running almost two years on my original Talon batteries. I am hesitant on upgrading to a new unit because this unit is still holding a charge and vaping great. This product owes me nothing I highly recommend this system. I wood like. to try. The Tallon a free sample. Vuse sent me a free system I hope. You can do it talso. I too am an ex-smoker and vuse sent me a sample kit to try. I am asking you to send me a sample kit to try.